Q: Does Santorini Have Uber? 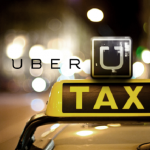 A: No, Santorini does not have Uber taxis. You will need to call one through the phone or from the road. Q: Does Santorini Have an Airport? A: Yes, Santorini has a small airport which hosts local and international flights. Q: Does Santorini Have Beaches? A: Yes, Santorini has at least 10 different beaches to visit. Q: Does Santorini Have Zika? A: No, there is no outbreak of the Zika virus in Greece or in Santorini. Q: Does Santorini Have All Inclusive Hotels? A: No, Santorini does not have all inclusive hotels. Q: Does Santorini Have Sharks? A: No, there is no problem with sharks in Santorini. You can swim without worries. Q: Does Santorini Have Earthquakes? A: Not often, but yes, an earthquake might take place in Greece and in Santorini. It is a seismogenic area. Q: Does Santorini Have Good Beaches? Q: Does Santorini Have Refugees? A: No, Santorini does not have refugees. The issue with refugees is in other Greek Islands, such as Mitilini. Q: Does Santorini Have Nightlife? A: Yes, and a vivid one. Not on the same wild level as in Mykonos island, but you will not get bored during the evening, no worries! Q: Does Santorini Have Mosquitoes? A: Yes, but there is no big problem with them. An occasional mosquito bite from time to time, especially during the afternoon times. Q: Does Santorini Have Black Sand? A: Yes, the Perissa beach and the Perivolos beach in Santorini are both beaches with black, volcanic sand. Pretty impressive (and hot to walk on!) too. Q: Does Santorini Have White Sand Beaches? A: No, you will not find perfect-white sand beaches in Santorini. It’s a volcanic island and the sand tends to be darker. Q: How Santorini was formed? A: Santorini was formed through a volcanic eruption. Q: Santorini – How to Get There? A: By airplane, or by boat. Or by divine intervention. Q: Santorini – How Many Days to Stay? A: You should plan to stay in Santorini for at least three full days. Q: Santorini – How Big is it? A: You can drive from one side of the island to the other in about 45 minutes to one hour. It’s a small island. 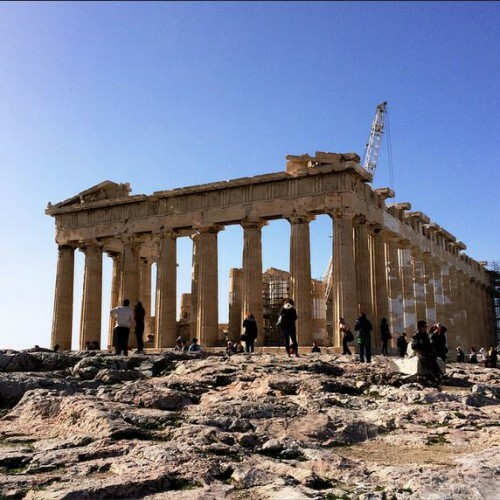 Q: Santorini – How Far is it From Athens? A: Santorini is 50 minutes’ flight time away from Athens. Or, about 5 hours with the fast boat. Q: Is Santorini in Greece? A: Yes, it is in Greece! A: Now, that’s a strange question we got. We cannot be sure – we are too young to remember. But you may try to find out for yourself and solve the mystery! Q: Is Santorini an island? A: Yes, Santorini is an island, in the Mediterranean Sea, in Greece. Q: Is Santorini worth it? A: Yes, it totally does. Amazing villages, views, volcanoes, nice people, white houses, perfect photo opportunities, romance, swimming, having fun, nice food. What more do you want from your life? 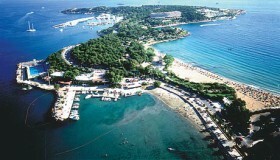 A: Yes, it is one of the most expensive islands in Greece. Especially if you visit it during July and August. 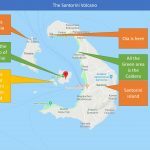 Q: Is Santorini Volcano active? A: Theoretically yes, but there doesn’t seem to be any reason to fear for the time being. Q: Santorini: Should I rent a car? A: Yes, that would be a good idea. However, the roads are small and very busy. And the parking is very difficult in the main village. But driving your own car will be much better than waiting for the buses in the hot sun. Q: Where to Stay in Santorini? A: You can read our detailed blog post on where to stay in Santorini here. Q: Should I visit Santorini or Mykonos? A: They both deserve a visit. Santorini is more romantic and might be better for couples, while Mykonos has a more vivid nightlife. Q: What was Santorini originally called? A: Santorini was called Thira. Q: When was Santorini’s Volcano eruption? A: Santorini comes from the words Santa and Eirini (peace). 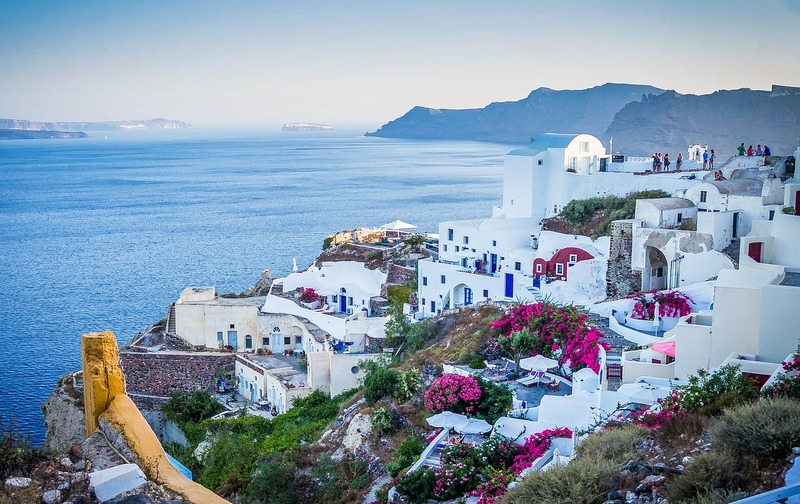 A: Santorini is known for its great views, the amazing villages of Oia and Fira, the sunset in Oia village, the black sand beach of Perissa, its volcano and for being expensive. A: Most tourists on the island are there in July and August. The touristic period starts on March and ends on November. March, April, May are low traffic months. June becomes busier. July even more. August is the busiest month and it slows down in September. October and November are even lower in traffic. Q: Santorini – When it rains? A: There are not many showers of rain on the island. Usually, it rains from December to March. But not often. 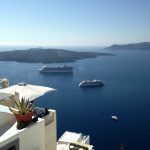 Q: Santorini – Where to stay? A: Click the link and get our extended answer on where to stay in Santorini. 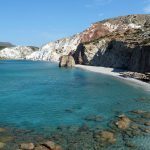 Q: Is Santorini good for snorkeling? A: Not so good. Don’t expect to see amazing fish or anything else really strange. Q: Is Santorini in the Aegean Sea? A: Yes, Santorini is in the Aegean Sea. Q: Is Santorini a country? A: No, Santorini is not a country. It is an island that belongs to Greece. And yes, Greece is a country. Q: Where can if I find a Santorini Travel Guide? A: Glad you asked. You can get a 3 Days in Santorini Travel Guide here. There’s no crazy question! 🙂 This is a great guide for anyone planning a trip to Santorini. Nice, quick overview of what to expect.